Rainshowers overnight give way to sun and clouds at daybreak. We linger at our anchorage in Valley Cove over breakfast in the cockpit, admiring this incredible setting. There is a 40% chance of rain today, but the morning sky does an impressive job of masking this possibility. 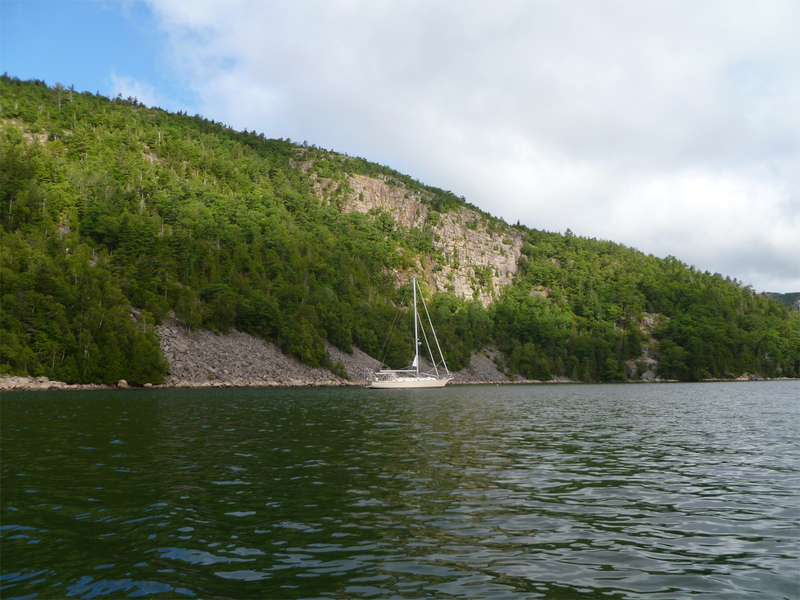 By mid-morning, Cutter Loose is moored in Northeast Harbor, a short journey of three miles from our anchorage in Somes Sound. Northeast Harbor is the place to be on a boat on Mount Desert Island. This small village offers essential services for cruising sailors (i.e., bakery, grocery store, laundromat, bank, etc.) without being a touristy t shirt shopping district. 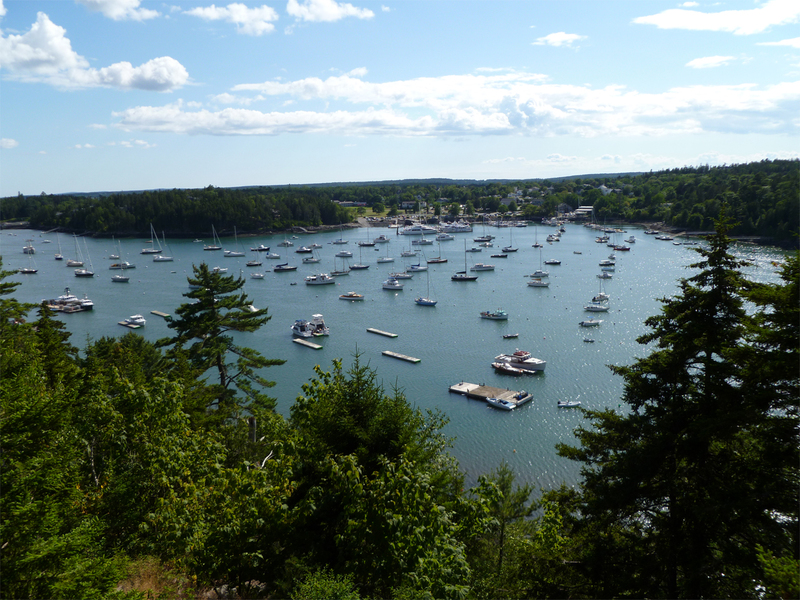 The mooring agent informs us that there are fewer boaters visiting Northeast Harbor this year. This is bad news for the village, but good news for us. We may remain on our moooring for as long as we wish. In the afternoon, we dinghy to Asticou Inn’s landing for a visit to Thuya Lodge and Gardens. This was the summer home of Joseph Henry Curtis, a 19th century Boston landscape architect. Mr. Curtis donated this property to a local public land trust. The gardens are impeccably designed and maintained. Afterwards, we enjoy a beverage on the terrace at the Asticou Inn overlooking the harbor. While we are admiring the view, a group of 20 touring bicyclists arrive at the Inn. They are part of a week-long organized trip sponsored by Vermont Bicycle Tours. Through our conversations with members of this group, we learn more about bicycling opportunities on the Island. We return to Cutter Loose to enjoy dinner in the cockpit while we admire our surroundings. During the meal, today’s 40% likelihood of showers becomes 100%, but surprisingly, the sun never stops shining. 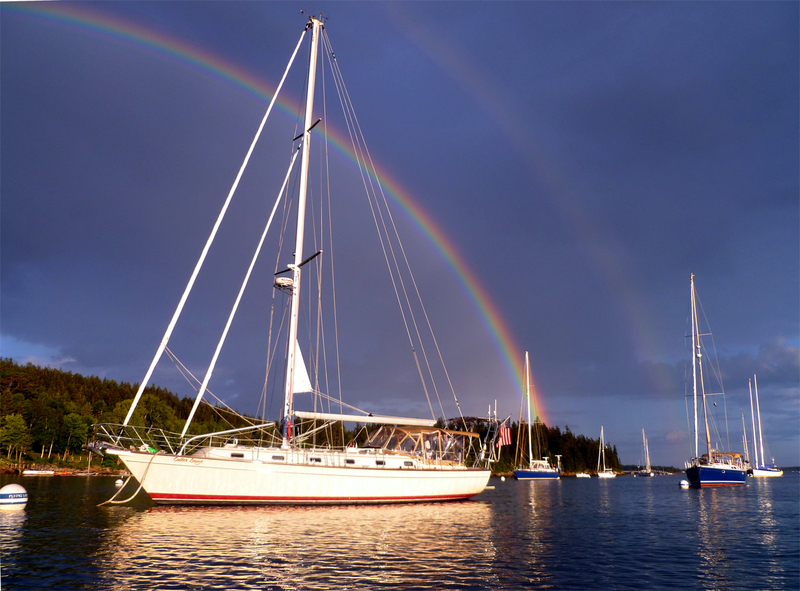 Just when we thought things couldn’t possibly be better, we are rewarded with a vivid double rainbow, one end of which touches down in the harbor…a good omen and a perfect ending to the day.